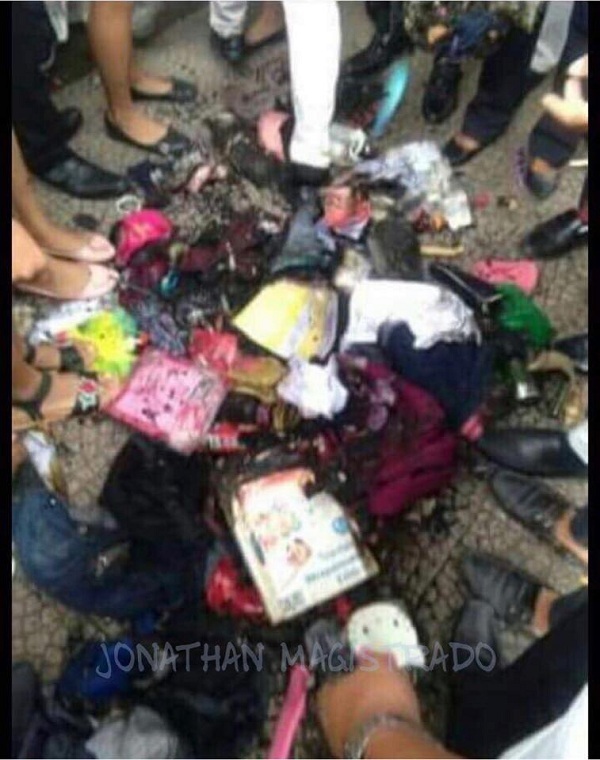 MANILA, Philippines – Apparently angry that the senior high school students brought bags on the announced “no bag day”, the owner of Bicol Central Academy in Libmanan, Camarines Sur confiscated the bags, then asked a school staff to burn these items at the quadrangle. The action has received much flak on social media, with many calling for appropriate action against the school owner. The owner was identified as Former Municipal Councilor and incumbent Provincial Board Member Alexander James Jaucian who at the time of the incident was filling out as substitute teacher while the regular ones were having a seminar with the DepEd at another building inside the school, revealed Jonathan Vega Magistrado in a Facebook post. Students at the school were told not to bring bags on that day, especially because they were instructed to wear business attire and Jaucian believes that backpacks would ‘ruin’ the outfit. They were told to bring much smaller bags, perhaps a pouch to put their valuables in. But some of the students defied the order, bringing backpacks and later reasoning out that they had brought bigger bags to put clothes in so they can change after the school activities that day. When Jaucian arrived at a classroom used as waiting area by the students, he reportedly got angry because the room was in disarray and was dirty. But he got angrier upon seeing that some of the students defied his order not to bring bags. He also saw a student who wasn’t in business attire but was wearing denim pants, rubber shoes, and a t-shirt. It turned out, however, that the student was assigned in Maintenance that day and was supposed to wear those clothes. 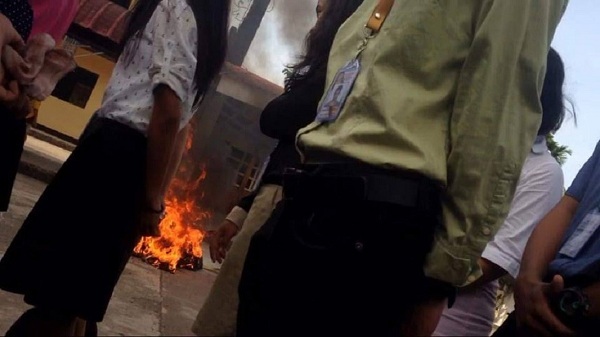 According to reports, Jaucian asked the students to assemble at the quadrangle where he told staff to burn the bags while he berated the students. He cursed at the students and called them ‘stupid’ upon learning that there were valuables inside the bags. Aside from school uniforms, notebooks, books, and wallets with money and ATM cards, the bags also had the students’ phones; some even had laptops. He hurriedly asked the staff to put out the fire when something (a laptop or phone battery) exploded in the pile but the fire extinguisher didn’t work. Staff hurried to put out the fire with water but the items were beyond redemption at this point. After the incident, the burned items filled 3 sacks. Angry parents are mulling on moving their children to another school but it remains unknown whether they will file a case against the school owner who also happens to be a politician. Many hoped that DepEd Division of Camarines Sur will investigate the matter and impose proper sanctions against Jaucian and the school.